As the city’s most eagerly awaited film festival, the 8th Jagran Film Festival draws closer; it has been revealed that this edition of the festival will open with the film, “The Fakir of Venice”. 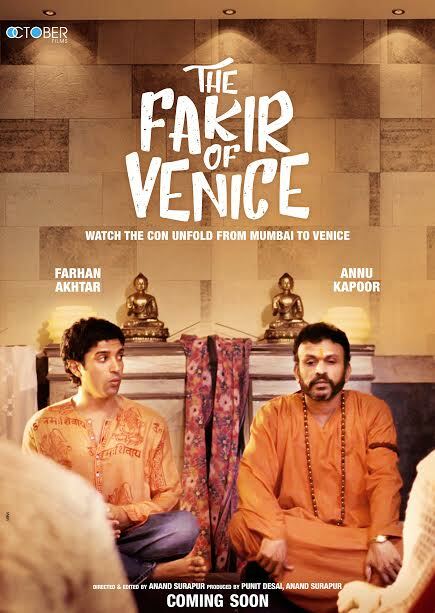 ‘The Fakir of Venice’, is an Indian film directed by Anand Surapur. The Fakir of Venice is a drama feature film that was inspired by the experience of filmmaker Homi Adjani of taking a Fakir to Venice. It is a tale of 2 common men who are hired to find a poor guy to be represented in Venice with the intent of pulling of a scam. Farhan Akhtar fits the part perfectly & Annu Kapoor has played his part gracefully. This film is captivating while being unconventional. About The Fakir of Venice: The A story is about an Indian con man who is hired to find a fakir who can bury himself in sand for an installation art project in Venice. He passes off a poor slum dweller from Bombay as the real thing, conning the European art world successfully. It is the story of a strange relationship. A relationship between two characters who are brought together to carry out a deception. To pull it off, however, they must learn to shed the layers of deceit, and move towards understanding themselves, and each other. · Cast: Farhan Akhtar, Annu Kapoor, Kamal Sidhu, Valentina Carnelutti and Mathieu Carrière.